William Joseph "Bill" Rosendahl (May 15, 1945 – March 30, 2016) was an American politician. He served on the Los Angeles City Council, representing Council District 11 from 2005 to 2013. He was a member of the Democratic Party. Rosendahl won election to Los Angeles City Council in May 2005. He represented the 11th District, which includes the communities of Brentwood, Del Rey, Mar Vista, Pacific Palisades, Palms, Playa del Rey, Playa Vista, Venice, West LA and Westchester. He was the Chair of the Transportation Committee, Vice Chair of the Trade, Commerce &Tourism, he was a member of Budget & Finance, Vice Chair of the Ad Hoc Stadium Committee, a member of the Ad Hoc on Economic Recovery & Reinvestment and a member of Board of Referred Powers. Serving as chairman of the Transportation Committee, he attempted to use his position to ease traffic congestion in America's most congested city, using Measure R funding to push for subway construction from finally completing the Green Line to expanding the Expo Line creating new bus routes, and seeking innovative solutions to mitigate the traffic problem. He served as vice-chair of the Commerce Committee, which oversees Los Angeles World Airports, including Los Angeles International Airport. Rosendahl was also a member of the council’s Transportation Committee, Budget & Finance Committee, and Ad Hoc Committee on Homelessness, which he co-founded. He chaired of the Southern California Regional Airport Authority and one of the city's appointees to the Santa Monica Bay Restoration Commission. From the time he took office in July 2005, Rosendahl focused upon: stopping the expansion of Los Angeles International Airport, promoting mass transit, enhancing public safety, curbing overdevelopment, standing up for tenants’ rights and for affordable housing, seeking solutions to the problem of homelessness and giving neighborhoods a greater voice in city decision-making. According to some his most notable achievement was the historic agreement between LAX and airport neighbors, ending airport expansion and promoting regional aviation. A resident of Mar Vista, the largest community in the 11th District, Rosendahl was the first openly gay man elected to the Los Angeles City Council, and was the city’s highest-ranking LGBT official. Prior to his election, Rosendahl was an educator and an award-winning television broadcaster with a long record as a leader in Los Angeles civic affairs. While he served as Distinguished Professor at California State University, Dominguez Hills until his election, Rosendahl is best known as producer and moderator of critically acclaimed public affairs television shows. As host of Local Talk, Week in Review and Beyond the Beltway, Rosendahl created a needed forum for discussion of public affairs. An advocate of empowering people through information, Rosendahl produced more than 3,000 programs over 16 years, opening the airwaves to all viewpoints and steering thoughtful dialogue on the most complex and controversial issues. As a cable executive, Rosendahl fought tirelessly for better service, upgraded technology, more local programming choices, and better wages and working conditions for his employees. Rosendahl's public service won him the Cable Ace Award, The Diamond Award, the Freedom of Information Award, the Los Angeles League of Women Voters Public Service Award and the Beacon Award for Cable's Free Air Time Project. Rosendahl also engaged himself in civic life. He chaired the California Commission on Tax Policy in the New Economy, served as president of the Los Angeles Press Club, as chairman of the Cable and Telecommunication Association and was a member of the education fund of the Los Angeles League of Women Voters. He was a regular moderator of community forums, steering discussions on various issues including charter reform, secession and the formation of neighborhood councils. Prior to his cable TV career, Rosendahl was a White House appointee to the State Department as Chief of Operations for the U.S. Trade and Development Program, served as an associate in philanthropic work for John D. Rockefeller III  and worked on many political campaigns, including Robert F. Kennedy's 1968 presidential bid. A Vietnam-era veteran, Rosendahl served in the U.S. Army from 1969 to 1971, spending a year as a psychiatric social worker, counseling troops returning from combat. As special assistant to the commanding general at Ft. Carson, Colorado, he won national recognition for reorganizing the base and boosting morale of the service people. Rosendahl was a member of The American Legion, Post 283, in Pacific Palisades. Rosendahl holds a Master of Social Work (MSW) from the University of Pittsburgh, and a Bachelor of Arts in Political Science & Economics from Saint Vincent College in Latrobe, Pennsylvania. Prior to being elected in May 2005, Rosendahl was an educator, television broadcaster and a vice president at Adelphia. Rosendahl's parents were immigrants from Germany. They met in New York City, they had three children and moved to Bergenfield, New Jersey to make room for their growing family. Eventually they moved to Englewood, where Rosendahl was born as child number six. His parents would have two more children, for a total of eight. While attending St. Cecilia’s Catholic School, he was elected president of the junior class and president of the student government. Rosendahl saw this as evidence that he had natural leadership capabilities. He was openly gay during the majority of his adulthood, but struggled with the idea of being gay in his youth. At the age of 29 he took eighteen months off from work and toured around the world, coming to the conclusion that he was gay. At first he was upset about this realization, due to the struggles he would likely endure. Rosendahl had first suspect that he was gay during early puberty in the Boy Scouts. He noticed that he had an attraction to boys instead of girls. He later checked out a book on homosexuality from a local library and learned about the significance of Fire Island and Christopher Street to gay people. Rosendahl would come to the realization later in his life that homosexuality was simply "another expression of nature," and no reason to be ashamed. Rosendahl stated in an interview with the Lavender Effect that he was the victim of a gay bashing while in graduate school. He was walking from a gay bar to campus when five men ran up to him screaming obscenities and slurs, and then began beating him. He fought back but received injuries. He filed a police report about the incident. Rosendahl endured discrimination while working at Westinghouse Broadcasting and Cable, where his boss removed his staff and placed him in a windowless office because they expected he was gay. At the age of 32, at his mother's funeral, he came out to his family. He later came out to his boss, the chairman of the board of Century Cable, and found his boss to be accepting. Christopher Blauman and Rosendahl were romantic partners for fourteen years. Blauman died from AIDS in January 1995. Later in life, he and Hedi el Kholti were partners for nearly two decades, until Rosendahl's death. Rosendahl had an affinity for nature, and believed that having a connection to the environment was key to preserving the mental health and vitality of gay people. He kept a garden regularly and considered it key to his survival. In 2012 Rosendahl was diagnosed with stage four cancer. He was told by doctors that he would likely be dead before the upcoming November elections. This pushed him to fight harder for the causes he believed in. Rosendahl received a large amount of support from the public. Visitors from many cultures and religious groups visited him during his illness. He believed this outpouring of support from the public gave him the strength to fight the disease well beyond its expected prognosis. Rosendahl died at his home in Mar Vista, Los Angeles of ureteral cancer on March 30, 2016 at the age of 70. ^ "About Bill Rosendahl profile". The City of Los Angeles: Council District 11. Archived from the original on 2011-08-07. Retrieved 2011-08-12. ^ "Food Trucks May Soon Need Parking Permits". Retrieved 2017-04-19. ^ "Ordinance requiring pets to be in cages at LAX approved by council committee". The Argonaut Newspaper. 2008-04-24. Retrieved 2017-04-19. ^ "L.A.'s NFL stadium financing plan clears key City Council panel". LA Times Blogs - L.A. NOW. 2011-08-03. Retrieved 2017-05-20. ^ "Ad Hoc on Economic Recovery & Reinvestment - Oct 16th, 2009". lacity.granicus.com. Retrieved 2017-05-20. ^ Weikel, Dan; Zahniser, David (2010-09-14). "City Council panel approves three contracts for LAX concessions". Los Angeles Times. ISSN 0458-3035. Retrieved 2017-05-20. ^ "L.A. City Council approves bicycle master plan". The Los Angeles Times. Retrieved 2011-08-12. ^ "ROSENDAHL ELECTED CHAIR OF SOUTHERN CALIFORNIA REGIONAL AIRPORT AUTHORITY" (PDF). City of Los Angeles. Retrieved May 20, 2017. ^ "Santa Monica Bay Restoration Commission Governing Board Members" (PDF). West Basin Municipal Water District. Retrieved May 20, 2017. ^ "LAX Expansion Opponents Pack Town Hall Meeting". The Marina del Ray Patch. Archived from the original on 2011-11-16. Retrieved 2011-08-12. ^ "Bill Rosendahl". IMDb. Retrieved 2017-05-20. ^ a b "Bill Rosendahl, 70: Former councilman had cancer". LA Observed. Retrieved 2017-05-20. ^ "Bill Rosendahl, 11th District Councilman, 70, Dead from Cancer". BH Courier. 2016-03-30. Retrieved 2017-05-20. ^ "COMMISSION ON TAX POLICY IN THE NEW ECONOMY TAX POLICY REFORMS" (PDF). Little Hoover Commission - Commission on California State Government Organization. March 25, 2004. Archived from the original (PDF) on 2009-05-02. Retrieved May 20, 2017. ^ "Bill Rosendahl – Los Angeles Press Club". lapressclub.org. Archived from the original on 2017-05-25. Retrieved 2017-05-20. ^ Congress, U. S. (2017-05-20). Congressional Record, V. 149, PT. 2, January 21, 2003 to February 11, 2003. Government Printing Office. ^ "Remembering Bill Rosendahl". Los Angeles County Supervisor Sheila Kuehl. 2016-03-30. Retrieved 2017-05-20. ^ reta. "» Former City Councilman Bill Rosendahl Dead at 70 - Venice Update". Retrieved 2017-05-20. ^ "Mourners Gather to Remember Rosendahl". NBC Southern California. Retrieved 2017-05-20. ^ a b c d e f g h i j k "Bill Rosendahl (1945-2016)". THE LAVENDER EFFECT®. 2015-03-03. Retrieved 2017-04-18. ^ Times, Robert A. Wright;special To The New York (1970-11-02). "Innovations at Fort Carson Make Army Life More Bearable for Draftees". The New York Times. ISSN 0362-4331. Retrieved 2017-05-20. ^ "The Victory Award". lazarex.ejoinme.org. Retrieved 2017-05-20. ^ a b Linthicum, Kate; Rocha, Veronica (2016-03-30). "Former Los Angeles City Councilman Bill Rosendahl dies at 70". Los Angeles Times. ISSN 0458-3035. Retrieved 2017-04-19. ^ Linthicum, Kate; Rocha, Veronica (2016-03-30). "Former Los Angeles City Councilman Bill Rosendahl dies at 70". Los Angeles Times. ISSN 0458-3035. Retrieved 2017-04-18. ^ Beloved Westside Councilmember Dill Rosendahl Dies At 70 Archived 2016-04-01 at the Wayback Machine, laist.com, March 30, 2016. 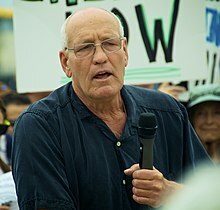 Wikimedia Commons has media related to Bill Rosendahl.